At every public meeting, citizens are invited to stand up and share their three minutes. Few hear their voices. This project makes it easier for citizens to keep tabs on public meetings. It uses data science and natural language processing to create a more visible dialogue between the public, citizens wishing to effect change, the news media and local government. The project aggregates the content of public meetings and makes them more accessible, easier to track and more shareable. Empower citizen engagement by allowing users to distill the content of local public meetings into meaningful, shareable insights. Public Comment makes it easier for users to track, search and share the outcome of public meetings. Currently most people do not attend public meetings. 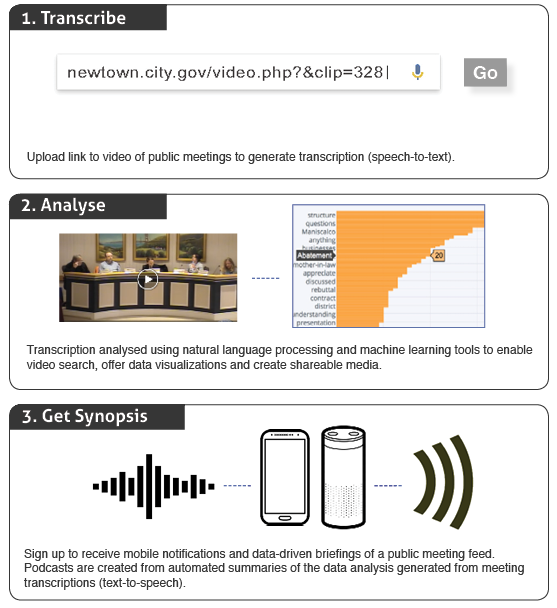 Open government laws compel states and local municipalities to make records of meetings publics, often in the form of video or audio recordings. However,due to their length, few take advantage of this public service. City managers, journalists and members of the general public find these records time consuming to access and difficult to use. HOW CAN WE MAKE THE CONTENT OF LEGISLATIVE MEETINGS MORE ACCESSIBLE, EASIER TO TRACK AND MORE SHAREABLE? Transcriptions are then analyzed using natural language processing and machine learning to identify key topics and phrases, people, agenda items and actions.